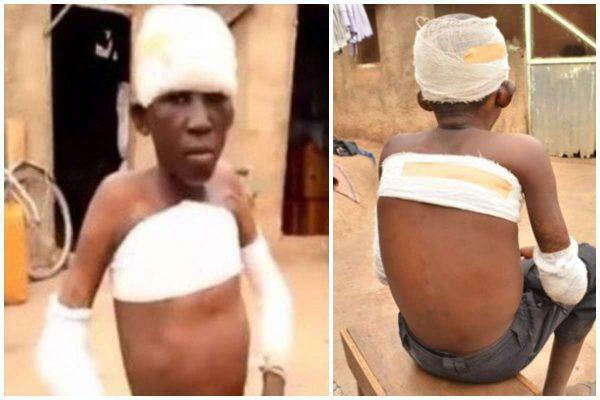 Maxwell Ayinbisa, an 11-year-old boy from Bolgatanga, in the far east of Ghana, was set ablaze for allegedly looking at a woman in a bathroom. Maxwell was caught by a John Nsobila, who sprayed him with gasoline and set him on fire. On 24 November 2017, Ayinbisa and two of her friends were sent by another to buy gas at a gas station. According to Ayinbisa, on the way to the race, a man accused him and his friends of having peeked at a woman in a bathroom. According to Maxwell Ayinbisa, he said his friends escaped leaving him behind. He was seized by his accuser, Nsobila John, who took the gas from him in a gallon, poured it on him and set him ablaze. When Class News visited the victim’s family in Pobaga, a suburb of Bolgatanga in the Upper East Region, his head, chest and both hands were bandaged. Maxwell’s father, Mustahpa Rahamani, told Class News about the suspect. Nsobila John, after covering the initial cost of his son’s treatment, abandoned him. However, the families of the victim and the suspect subsequently reached an agreement to settle the case amicably.